The first track “Interlude No. 1a” is a piece for solo euphonium performed by Lauren Casey-Clyde. The euphonium overlays a field recording of the sounds of a city: the bustle of feet and phantasmic voices, a blaring siren, the pulse of blips prefiguring a crossing signal. Set solo against these anonymous city-sounds, the melody is lonely and full of empty space and breath. The euphonium will return with subtle variation in a new acoustic space—first the forest, finally the sea—but not yet. It recurs in key moments, a return with variations, supporting, like variegated balustrades, our flow through Quigley’s exhibition. “Intervention No. 6” is divided into two subsequent tracks, as “Episode I” and “Episode II.” Both of these tracks are markedly different, however. “Episode I” is a dynamic and subtle piece for solo viola, performed by Samuel Kelder. Playing with double stops, close (dis)harmonies, and mechanic pulsing rhythms, the viola wavers in and out of tension, deferring its final release in an authoritative accelerando. This is followed by “Episode II,” performed by Alexander Thomas on the piano. 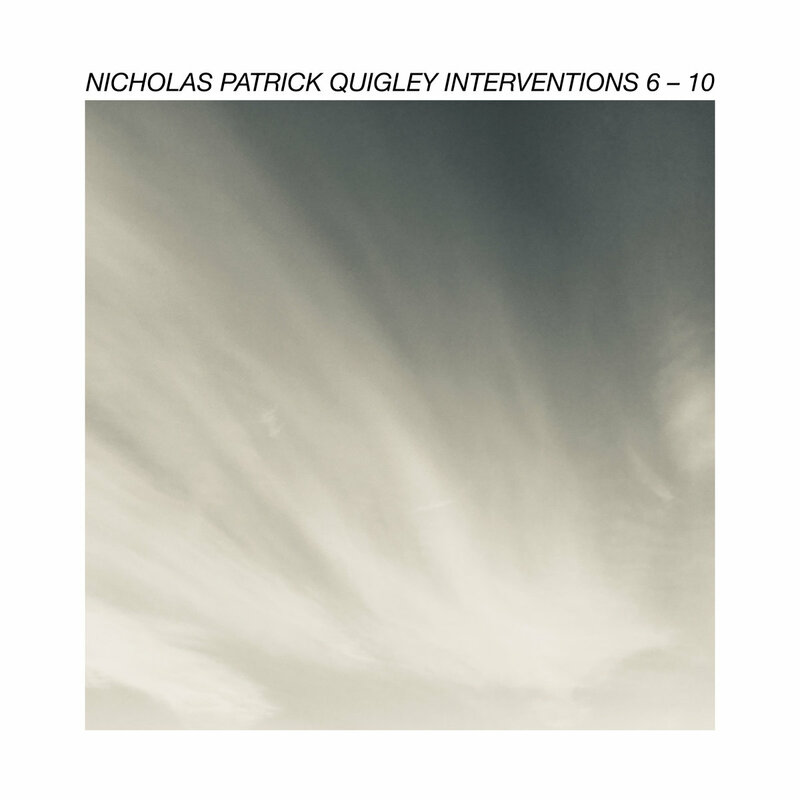 This track is deeply redolent of the minimalist composers who inspire Quigley. If the first episode features a rapid wavering between the tense and the harmonious in its speed and intervallic closeness, this track inverts this into a slow ebb and flow, spacious in its harmonic color and rhythmic breadth. The sonic fullness of “Episode II” creates a logical flow into the next track, “Intervention No. 7,” which is a harmonically rich, synthesizer-based song sung by Quigley. His voice is sweetly stands amidst a polyphony of synthesizers, and sings of somber, intimate things like love and secrets. It is unique on the album not only because it’s the only track with vocals, but also because it’s the only track where Quigley’s emphasized notion of the dichotomy between acoustic and digital ‘spaces’ is sublimated. “Intervention No. 8” is for viola and metronomes and tuners, and is divided into three sequential episodes. Each episode exhibits different viola techniques, as well as different deployments of metronomes and tuners for musical effect. In the first episode, the viola is played pizzicato—the strings are all plucked by fingers on the right hand. In the second episode, it is played with percussive taps of the bow on the strings. In the final, third episode, it is played arco, or bowed, with long, continuous notes. It is interesting to hear how Quigley explores similar harmonic material with different articulations. Perhaps more interesting, though, is how these more typically “musical” sounds are interwoven with different metronome and tuner sounds to a quite unique musical effect. In the latter two tracks, for instance, the metronomes are are not synchronized with each other. In each of these tracks, the triangle wave-ish tone of the digital tuner interacts with the different articulations of the violin—which itself produces a similar, triangle wave-ish tone, especially when bowed—to create mysterious harmonies and ambiguous timbral syntheses. In this way, these tracks also play with the dichotomy between digital and acoustic spaces. Interestingly, these are digital sounds which inhabit quintessentially acoustic spaces (such as a music practice room). They’re also digital sounds which are not typically considered musical, but are deployed to successful musical effect. Following this is “Interlude No. 1b.” The euphonium melody is familiar, but varied. But now, rather than in the city, we find ourselves amidst the sounds of birds and insects. A new sense of place emerges in the context of the whole album. “Intervention No. 9” brings us back to the immediacy of a digital space. The bright stabs of the arpeggiated synthesizer deny concrete emplacement. They’re free-floating and slowly modulating. In the course of the album, I’m reminded of “Intervention No. 6, Episode II.” The rate of modulation on that piano track—that is, the subtle ebb and flow between tension and release—is similar to what we hear here. However, it lacks the “warmth” of the timbre of the acoustic piano, the lush fullness of its harmony. In its place, the immediacy of the synthesizer delineates for itself a stark and bright space, which it fills with but a few simple elements and gestures. “Intervention No. 10,” then, is the final intervention of the album. It is for the viola. It is arduous, slow, languid, and seems to transform with the pulse of my breath. Over a drone, wobbling, beating, incredibly close intervals exhale into pure and seemingly undifferentiated perfect intervals and unisons, or inhale upwards to shape variegated melodic contours before settling back into wobbling closeness and the finality of the drone tone. “Interlude No. 1c” concludes the album with a return. The waves lap upon the shore, and then again, and then again. The euphonium is back, and now it is playing around with its now-familiar tune with these waves, and then the seagulls. The lapping of the waves and their white, foamy noise still reminds me of the cars in the city streets. An ebb and flow as the euphonium proclaims its lonely autonomy out here at the edge of things. So goes Quigley’s exhibition of interventions. It is a satisfying collection of compositions performed by some especially skilled interpreters. It’s subtle, polished, and intentional; although on the first listen, some tracks stand out due to their contrasting instrumentation and realization, these contrasts are revealed to be integral to the overall architecture of the listening experience. In many nested ways, the album as a whole as well as individual tracks find their form through stark differentiation, or forgetting, and a return to sameness, or remembering. Not only do individual tracks provide interest and opportunities for reflection and pondering, but so does the larger-scale metaphor of the album, overall, as an audible and imaginatively spatial experience. But of course, these are all just my words about these sounds, a napkin-scratch-map of a vibrant and unfolding process. Give it a listen, and see where how you flow through its architecture, and see what surprises your angle of arrival reveals — after all, no one quite walks through a space the same way twice.